Celebrating Keith Lockhart’s 20th anniversary as Boston Pops Conductor, the orchestra's 2015 Spring Season opened on Wednesday, May 6 at 8 p.m. with Tony Award-winning actress Bernadette Peters as the special Opening Night guest. Maestro Lockhart was fetted in grand fashion at the end of the evening with a five-foot tall cake presented on stage at Symphony Hall. 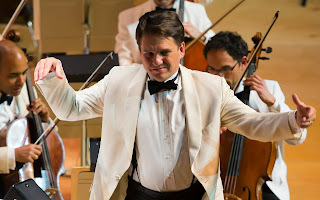 Keith Lockhart opened the first concert of the 2015 Boston Pops season with John Williams’ celebratory “Sound the Bells!,” a musical tribute to Frank Sinatra, on the occasion of the 100th anniversary of the singer’s birth, and the premiere of a new orchestra arrangement of Meghan Trainor’s hit pop song “All About that Bass,” written exclusively for the Boston Pops. The Broadway megahit “Everything’s Coming Up Roses”—the first piece Keith Lockhart led in 1995 after being appointed Boston Pops Conductor—opened the second half of the program, which featured Broadway songstress Bernadette Peters in a selection of beloved songs from the Broadway and great American songbook canons. Complete details about the 2015 Boston Pops season are available at www.bostonpops.org.